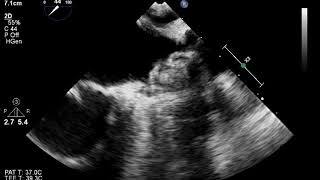 The risk of cardioembolic stroke is high in patients with atrial fibrillation. Antiplatelet agents, vitamin K antagonists, and new oral anticoagulants (NOACs) are effectively used to reduce the risk of thromboembolism in high-risk patients. However, increased risks of life-threatening bleeding and narrow therapeutic indexes result in inadequate utilization of these therapies. 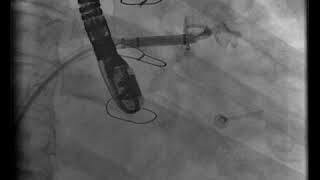 There is growing practice and evidences in favor of closing the left atrial appendage (LAA) percutaneously by using different devices in patients with either contraindicated or difficult anticoagulation. We report a rare case of a 75-year-old man with atrial fibrillation, high thromboembolic risk (CHADSVASc score of 4), and high bleeding risk score (HASBLED score of 4). 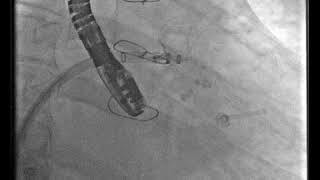 He underwent LAA closure using 2 LAA percutaneous closure devices (Watchman) due to bilobed LAA. 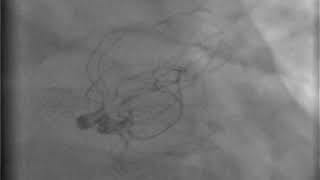 Considering the great variability in shape and size of the LAA, a single device may not always cover the whole ostium, which leads to residual leaks that can cause a nidus for thrombus formation. 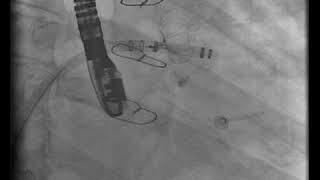 Although it technically sounds feasible, a few challenges are associated with double-device implantation. Sealing of the bilobed LAA is technically possible, especially with favorable anatomy, which includes totally separated bodies of both lobes with adequate body sizes. On contrast injection (RAO 200, CAU 180) showing bi-lobed LAA morphology with very wide ostium. Contrast injection after implantation of WATCHMAN device anteriorly showed posterior lobe with good size ostium. 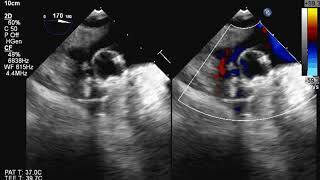 TEE image at 170 degrees with color showing implanted WATCHMAN device in anterior lobe with significant gap and flow posteriorly. Cine clip showing release of second WATCHMAN device. Cine clip showing two WATCHMAN devices (Kissing WATCHMAN). TEE image showing well seated two WATCHMAN devices at 44 degrees.